Regular readers may recall our article on Best Dual Fuel Generators: Power When You Need It. In that article, we highlighted the advantage of a dual fuel generator over the typical gas-powered generator because of the former’s flexibility to be powered by gasoline or propane. One of the featured dual fuel generators was the Duromax XP12000EH, which is a close cousin to the Duromax XP10000EH that we will be discussing in this article. 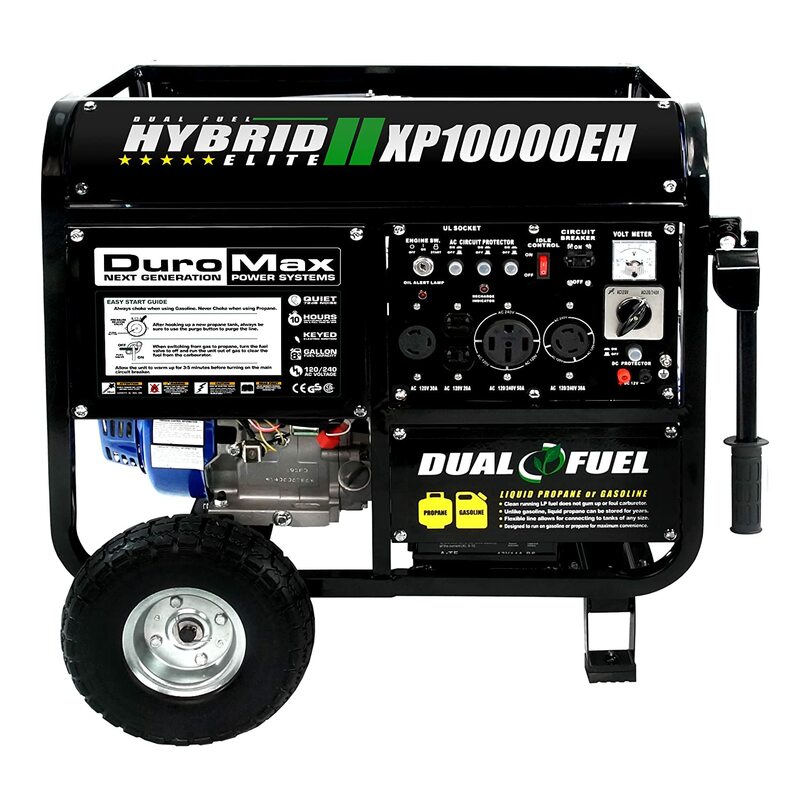 If you want a dual fuel generator that is portable and powerful, you should consider the Duromax XP10000EH. Many customers who bought this generator were satisfied with its performance and here’s why. Reliable and powerful power generator that can run both 120V and 240V appliances. Heavy but comes with a wheel kit and handles. Runs on propane or gasoline. Expensive but worth the splurge for heavy users. Mixed reviews on customer service, with a 30-day replacement warranty and a 1-year parts warranty. Overall, the Duromax XP10000EH is a great dual fuel generator. 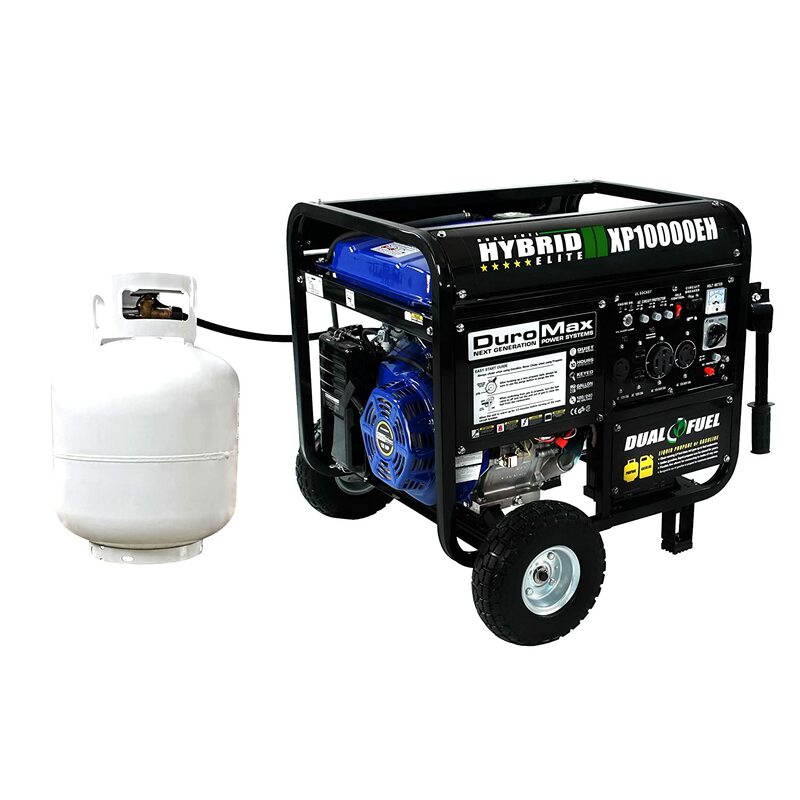 Besides the option to power the Duromax XP10000EH with gasoline or propane, this dual fuel generator also comes jam packed with many impressive features: a powerful and reliable engine that offers quiet operation, fuel efficiency, as well as safe and relatively easy operation due to the well-thought-out design. Most of the cons can be mitigated or are relatively negligible. The generator may be heavy but it comes with a wheel kit and handles for greater ease of moving it around. Its propane fuel hose appears to be too close to its wheels, but that is not a major design flaw if you consider the rest of its great design features. The only major downside would be its non-CARB compliance, which means that the Duromax XP10000EH cannot be sold in California. So, as long as you are not living in California, the Duromax XP10000EH is a worthy buy with all things considered! Before we dive into a detailed analysis of the Duromax XP10000EH’s pros and cons, let’s take a look at its key product features and specifications, which are summarized below. The Duromax XP10000EH’s 18HP 4-stroke OHV (overhead valve) engine can deliver 8,000 running watts and 10,000 starting watts, also known as rated and surge watts respectively. What this means is that this dual fuel power generator can deliver 8,000 running watts to run your appliances and it can also deliver an extra 2,000 watts to give some appliances a boost if they need more power to get started. According to the reviews of most customers, it appears that the Duromax’s running power is more than sufficient for household needs during power outages, camping trips and even construction sites for some commercial users. The Duromax XP10000EH engine has a half-load runtime of 10 hours. 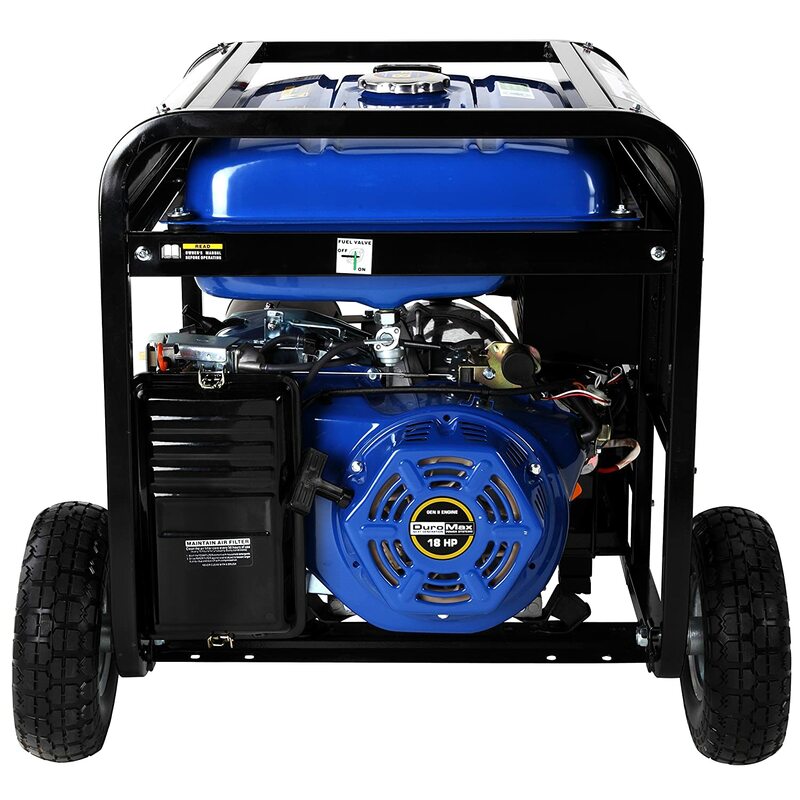 This is perfect during times of emergencies because this dual fuel generator can last for almost half a day. It’s also great for those overnight camping trips. In fact, if you are not loading this dual fuel generator with too many appliances, it should be able to last beyond 10 hours. What’s more, the Duromax XP10000EH engine runs at a constant speed, which means that this dual fuel power generator can handle large electrical loads as well as multiple small load and delicate appliances like your laptops and handphones without damaging them. Whether you are using the power generator on a camping trip or during a power outage at home, you wouldn’t want a generator that’s too noisy, would you? In the past, powerful fuel generators usually came with the downside of high noise levels during operation. Nowadays, with all the technological advances, many power generators offer quiet operation and the Duromax XP10000EH is no exception. At 21 feet, the Duromax XP10000EH produces a noise level that is approximately 72dB. This is because of its super quiet muffler which reduces its noise level during operation. When idle, the Duromax XP10000EH only produces a noise level of 45dB. While there are other power generators that can operate at even quieter levels, we think that the Duromax XP10000EH is still pretty impressive. As mentioned earlier, the Duromax XP10000EH can last up to 10 hours on its 8.3-gallon gasoline fuel tank at 50% load capacity. For liquid propane, you can connect this dual fuel power generator to any sized fuel tank. Some customers have reported that the Duromax XP10000EH lasted for 30 to 40 hours when running on medium/high capacity with about 5 gallons of propane, which is pretty impressive! With the Duromax XP10000EH, switching from gasoline to propane can be as easy as the flick of a switch. All you need to do is to use the propane hose and regulator that come with the Duromax XP10000EH. One thing to note is that the propane needs to be between 3 to 200 PSI to work. 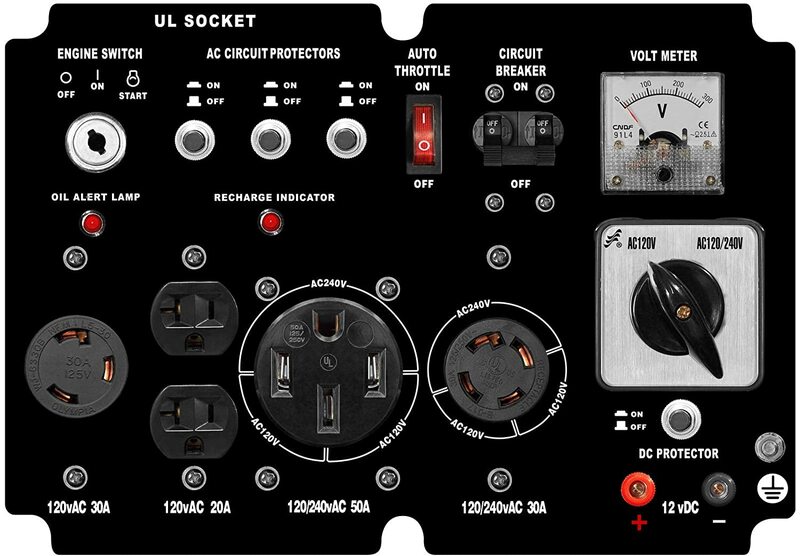 Another convenient feature would be the Duromax XP10000EH’s full power panel which centralizes all of the configurable components in one place. This makes it extremely easy for the user to operate the generator. The circuit breaker, advance oil warning light, electric start switch, volt meter and the power outlets are all located on the power panel so you can start the generator up, plug in your appliances, check on any problems, etc. This duel power generator can be started by turning the electric key switch or the backup recoil start. The Duromax XP10000EH is a hefty 265lbs and you may find it difficult to move this dual fuel generator around. With its mobility kit, however, moving the Duromax XP10000EH around can be a breeze. The solid-fill tires will not run flat and the high leverage handles make it easy to manoeuvre the generator around uneven terrain. The Duromax XP10000EH is not CARB (California Air Resources Board) compliant, which means it cannot be sold in California. Nevertheless, if you do not live in California, this should not be an issue for you. This generator is EPA-certified, so you can use it in any state park in the US. You may find the propane fuel hose to be too close to the generator’s wheels. That said, this is not a fatal design flaw. To sum it all up, the Duromax XP10000EH is a versatile and powerful generator that comes with several remarkable features. 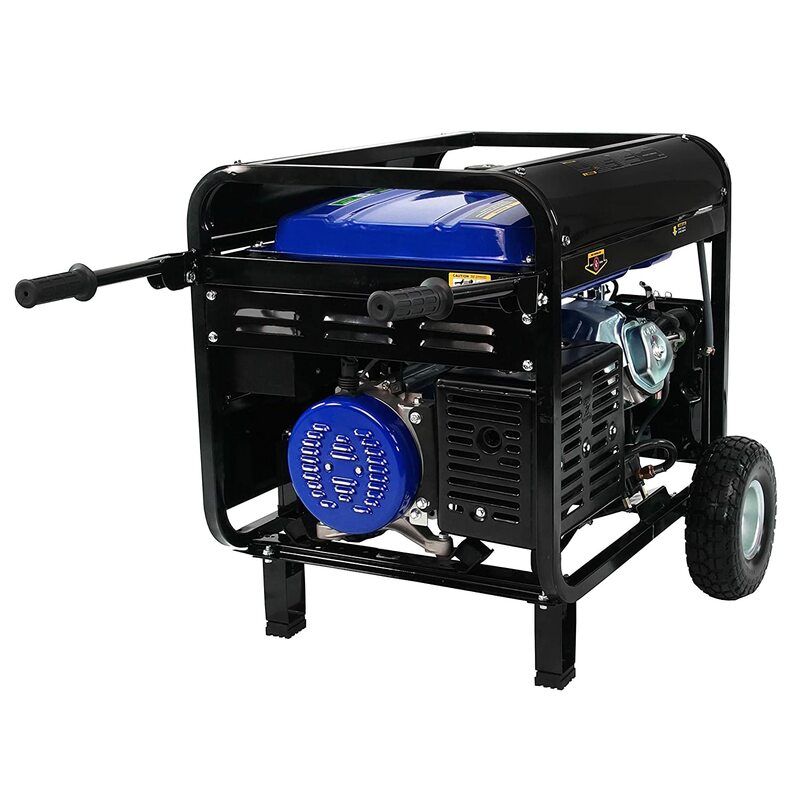 Many customers have commented that this generator is durable and does not require much maintenance cost. If you are still considering, be sure to view the above video from Duromax for a great summary on this awesome dual fuel generator!